Voxel Fungus | gURROO - A new generation of innovative minds. Since artificial constructions in metropolitans used to block out natural organisms, the idea of bringing the natural resources back to the built environment is demonstrated in this project. Cybernetics bridge the virtual and the physical world by combining advanced computational design with bio-technologies. It aims to establish an exchange system which can learn from its surroundings and adapt to evolve into a responsive ecology. 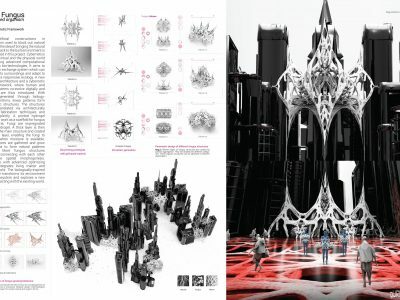 A new type of bio-architecture and a cybernetic design framework, where human and biologic systems co-evolve digitally and physically, are thus introduced. With particles generated through biology-based algorithms, linear patterns form into organic structures. 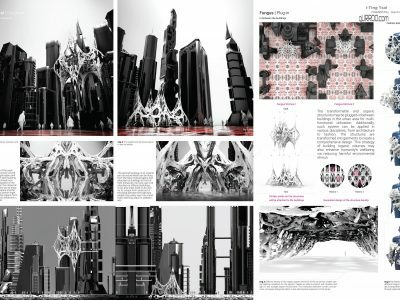 The structures can be translated via architecturally applicable fabrication techniques and shaped explicitly. BiotA Lab at the Bartlett School of Architecture in London explores ways of making bio-materials available on building relevant scales. Inspired by the hydrogels research, a printed hydrogel screen may work as a scaffold for fungus growth. First, Fungi are impregnated within a hydrogel. A thick layer is then printed as the main structure and coated with a thin layer, enabling the fungi to be active when moisture is available. Fungus spores are gathered and grow into mycelia to form natural patterns afterward. More fungus structures aggregate, connecting with each other to produce spatial morphogenesis. 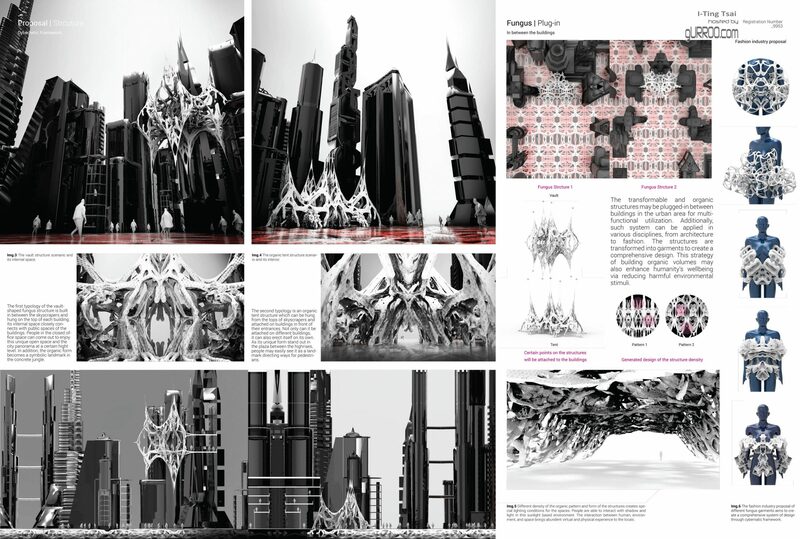 The transformable and organic structures may be plugged-in between buildings in the urban area for multi-functional utilization. Additionally, such system can be applied in various disciplines, from architecture to fashion. The structures are transformed into garments to create a comprehensive design. Architecture with advanced optimizing behavior integrates living matter and the built world. This strategy of building organic volumes may also enhance humanity’s wellbeing via reducing harmful environmental stimuli. The biologically-inspired architecture transforms its environment into an ecosystem and explores a new way of interacting with the existing world.